AFTER finding his young son bleeding and unresponsive among fallen concrete blocks yesterday, Mikhail Granger made a desperate attempt to save the child’s life by running with him on his back to a nearby health centre. Unfortunately, little Pawaan Granger did not survive. The five-year-old had been picking leaves from a tulsi plant outside the two storey house his family rents in Coolman Trace, Fyzabad around 9am yesterday when a portion of a concrete wall fell on his little body. Fighting back his tears yesterday, 58-year-old Mikhail pointed to the blocks that caused the fatal blow to Pawaan. Out of the six blocks, two still had tufts of the child’s hair and splatters of his blood. HAPPENED HERE: Mikhail Granger points to the area where a wall fell on his five-year-old son Pawaan at their home in Fyzabad yesterday. “I never expected this wall to fall here, there are a few other walls around the house that we know are not stable and we usually warn the children away from those areas, but this one caught me off guard,” he said. “When my wife picked him up, I just put him on my back and ran the 500 or 600 yards to the health centre with him. I felt when he took his last breath on my back but I couldn’t stop…I thought if I could get him to the health centre in time, they could help him.” Pawaan was declared dead at the Fyzabad health centre. Natasha Granger, Pawaan’s mother, told Newsday he had gone to pick tulsi leaves to eat as was his daily routine when the incident occurred. “From the time he learned to walk, he would pick the tulsi leaves and eat because when I was pregnant with him, that was all I ever craved,” Natasha said. Within minutes, 40-year-old Natasha and Mikhail heard a loud crash from the side of the house. Unable to contain her emotions, Natasha held onto relatives and neighbours and wept as she recounted the incident. When she could speak again, she said Pawaan was the most polite, loving child. He was a first year pupil at the Siparia Road Presbyterian School. Natasha has two daughters, Peaches, who is 15 and seven-year-old Pretty. She said she is no stranger to losing children as Pretty was born a twin. Pretty’s sister died within two days of her birth at hospital from organ failure. Natasha said just before Pawaan started primary school last September, she suffered a miscarriage of a full-term baby boy. Pawaan’s is the third such death to happen in the area within the last few months. Last Tuesday, high winds knocked over a wall on a construction site in Rancho Quemado and falling bricks crushed 72-year-old Percival Laing. Laing, of St Francis Village Erin, was a supervisor on the site and had tried to run from the falling debris but fell. He died on the scene. 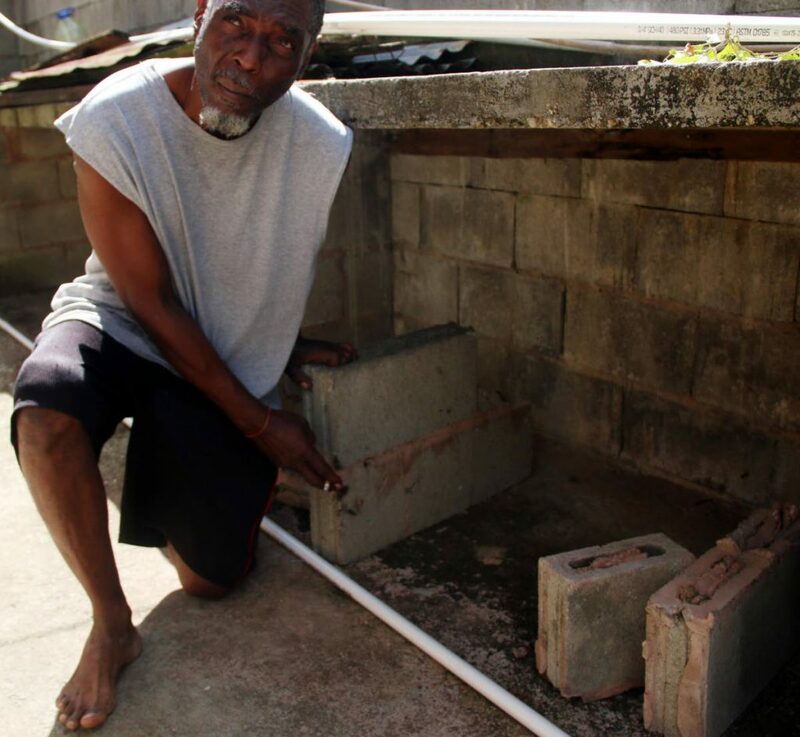 On February 22, Roger Lewis was found dead at his Jacob Settlement, Santa Flora home beneath a pile of rubble from a concrete wall he had been demolishing. He had been dead for four days. The 44-year-old lived alone and was found by the pastor of his church. Reply to "DAD: HE DIED IN MY ARMS"